» Buyer’s Guide: The Best Foosball Table to Buy. Buyer’s Guide: The Best Foosball Table to Buy. Choosing the best foosball table can be a daunting task. Foosball tables are wonderful additions for any game room. This popular and entertaining game is both competitive and fun for the everyone in the family. It can be played with just two people or as many as four. There are a number of foosball tables on the market, which means that trying to find the right one can become a bit overwhelming. This guide to purchasing a foosball table will make it easier for you to determine what t﻿﻿ype of ﻿foosball table﻿﻿﻿ is right for your needs. The first thing that you are going to need to decide is the type of foosball table that you wish to buy. This post describes the different types of foosball types so you will be more informed when making your decision. There is three main types of tables, stand alone, multi-game and tabletop. This post contains affiliate links, which means I may receive, at no additional cost to you, a small commission from Amazon.com if you make a purchase using the links. 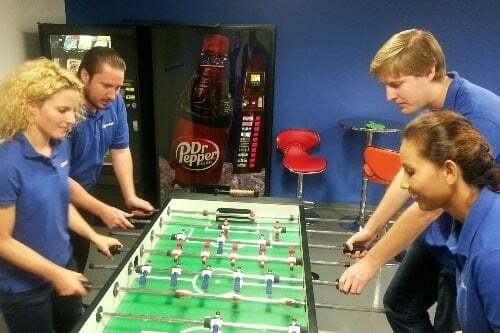 When you are purchasing a foosball table, stand alone tables are often the top choice. This table stands on its own as is suggested by the name. There are several different sizes of stand alone tables from which to choose, but most are about 5 feet long and 2 and a half feet wide. When properly cared for, stand alone tables will last for a long time and are ideal for offering the most authentic playing of the game. These type of tables are what we recommend to go with as they tend to be higher quality and will handle strong play. We know you want the best foosball table to play on that will last for years. 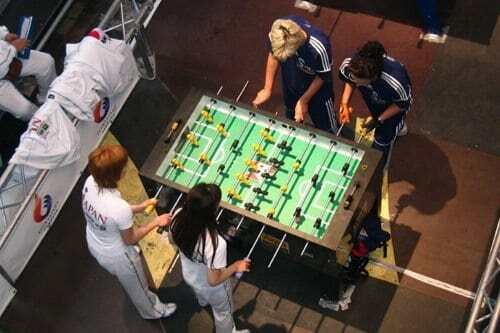 A tabletop foosball table is good for those who have a limited amount of space and may be on a limited budget. These tables can be set up on any type of hard surface that you may have and then stored away when they are not being used. 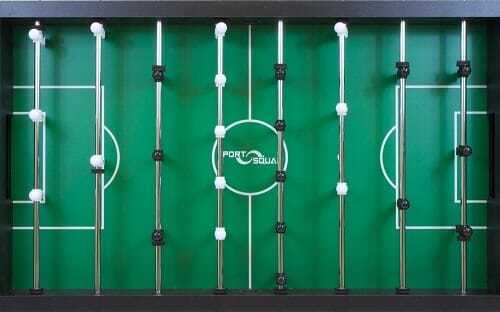 Tabletop foosball tables are great for young children as well as beginners. Since they are typically cheaper than the other foosball table options they provide new players with the chance to learn more about the game before making a large investment into a more expensive option. When choosing your tabletop foosball table make sure to look for one that has non slip pads on the bottom so that it will stay in place. Multi game foosball tables are made so they can be converted to play other games such as checkers, chess, table tennis, and air hockey. If you have children who like variety, a multi game table is often a good choice. Multi-game tables are also a good choice if you have a limited amount of space in your game room and want some different options available. Multi game tables come in both stand alone versions and in tabletop versions. To play a game different than foosball you will need to remove the rods. These tables are typically fairly easy to convert to the different games that they offer. Who Is The Foosball Table For? The first thing that you want to consider when purchasing a foosball table is who you are buying it for. There are foosball tables designed specifically for children and others that are designed for adults and professionals. Think about who is going to be playing on the foosball table. How old are they? Are the players just starting out or have they played a bit? Do you need a table that is for an advanced player? These are all questions to consider before you begin the search for the perfect foosball table for your home. When considering who you are purchasing a foosball table for, here are some tips. If you are buying a table for a child or beginning player or just for casual play in general, it makes sense to purchase a cheaper table. For younger children and for beginning players a tabletop foosball table may be the right choice, especially if you do not know if they are even going to like playing. If they do not like it, you are not out a lot of money. However, if they really enjoy the game you can always purchase a bigger and better brand table in the future. 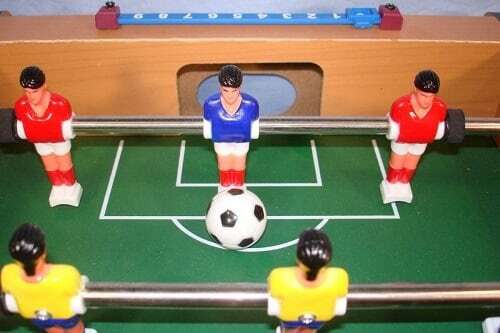 A tabletop foosball table is ideal for smaller children because many of the standard foosball tables are too tall for them. Tabletop foosball tables are not so cheap that they are not worth playing on, but they are not meant for anything but casual play. 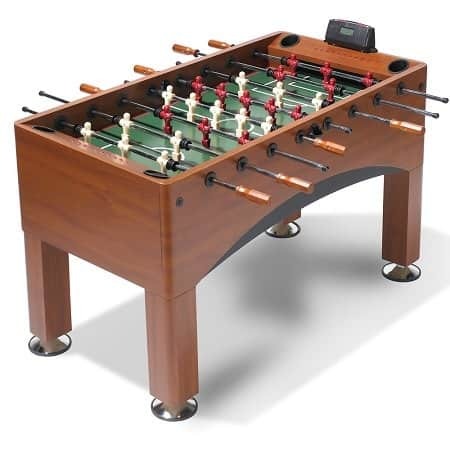 If you are purchasing a foosball table for people that have a bit of experience playing the game, you will want to search for a mid level table that offers adjustable table legs, smooth rods, and durability so that it can withstand a bit of vigorous play over longer periods of time. A mid level table is typically sturdy and made of higher quality materials. These tables are ideal for those who play the game often and want to improve their skills. Choose a table that weighs at least 125 pounds as the heavier the table is, the more stable it is going to be. If you are an advanced player or simply want a playing experience that is ideal, a top of the line regulation sized foosball table is the only choice. These tables are very sturdy, offer a flat playing surface and are made with the best materials. The tables are very heavy with some weighing more than 300 pounds. Your Budget: Good or the Best? 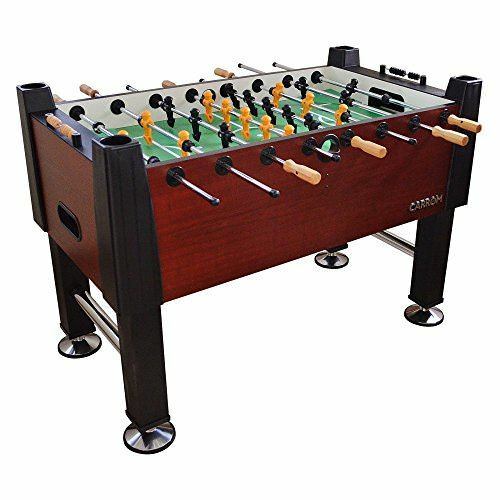 If you are going to be purchasing a tabletop foosball table the amount that you will spend is not going to be much as most of these tables are priced at less than $100. If you want a stand alone table, the price could definitely be a factor that you need to consider. The price range for stand alone foosball tables ranges from around $100 up to several thousand dollars. You will need to think about how long you plan on keeping the table and how much you want to spend on it. Setting a budget for your foosball table purchase is important as this will provide you with a good place to begin your search. When considering your budget, the price of a foosball table will often tell you a lot about the materials that it is made with. Here are some tips to consider when looking at the materials that a foosball table is made from. Foosball tables that u﻿se ﻿﻿parti﻿cle board are often not as durable. 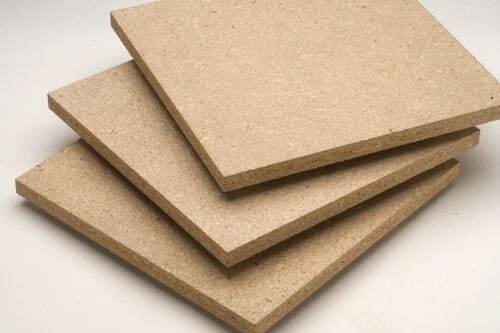 Particle board deteriorates over time, which can cause screws to become loose and may lead to the table simply falling apart. If the table weighs less than 70 pounds and the walls are less than a half inch thick, the table is likely made from particle board. A lightweight table made from particle board is ideal for those who do not want to invest a lot of money in a foosball table or those who are simply looking for a table for their kids to play on casually. 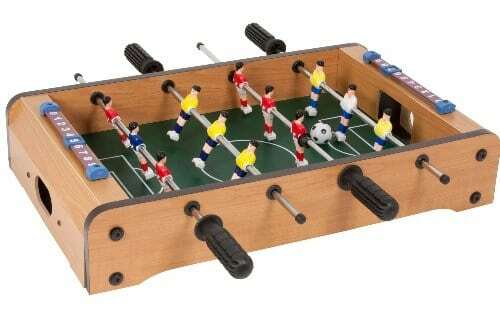 The majority of the more expensive foosball tables are made out of either solid wood or composite. It is important to note that not all wood is created equal. There are some tables made of pressed wood. Pressed wood has a tendency to warp over time as it absorbs moisture. Composite is more resistant to humidity and moisture and because of this is less prone to becoming warped or damaged. Composite is very durable. When considering the wood, thickness plays an important role. Choose a table that has at least one inch thick wood as this will be more durable. Some of the higher end models use one and a half inch thick wood. Thicker side walls help to prevent movement so that the game is not affected. 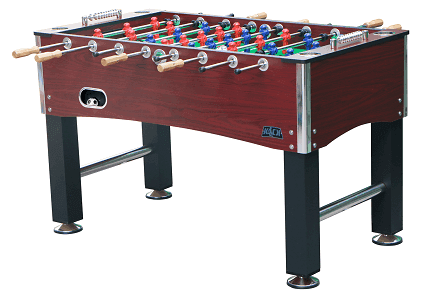 There are three types of rods to consider when purchasing a foosball table. They are telescoping, hollow, and solid. The highest quality rods are hollow. These rods weigh less, which makes them faster. Hollow rods are ideal for the more advanced players. Many mid level tables will have solid steel rods. This is best for intermediate players because the game goes a bit slower. There are some of the high end tables that offer telescoping steel rods. These are made of 2 pieces of metal. An inner piece will slide into the outer piece so that they do not stick out of the ends of the tables. The benefit of this is that you are not going to get poked by a rod that sticks out from the other side. The main purpose of this is safety for younger children. There are some tables that are priced at $600 and above that have rods made from cold rolled steel, which is the highest quality steel that you can buy. A hard smooth surface is going to provide the fastest game play. European tables often have wood surfaces for slower play while American tables often have harder surfaces for quicker play. The thicker the surface of the table, the more sturdy and level it is going to be. There are even some tables that use tempered glass to provide the highest level of play. A standard height for foosball tables is 36 inches. This is a great height for teens and adults. There are some tables that have legs that adjust a few inches. The main purpose of this feature is to even out a table on a floor that may be uneven. A higher quality table will have levelers that can be used for this purpose as well. As mentioned, a full size table will measure 56 inches long, 30 inches wide, and will be 36 inches tall. In order to have enough space to be able to play, you will not only need room for the actual table, but you will also need about three to four feet of playing space around the table. One Or Three Man Goalie? Most of the American foosball tables will use a three person goalie, while a one person goalie is common throughout Europe. The 3 person goalie is designed to make play faster and a one person goalie will require more skill and precision. This is a decision that is entirely up to how you want to play foosball. There are some tables that come with men that have counterweights. This means that they will stay horizontal when you place them in that formation. Keeping your men horizontal means that they are out of the way when you are shooting. This is a feature that is valued by most intermediate and skilled players. The men can also be made out of either metal or plastic. Metal men are obviously heavier, which means that you will have more power while you are shooting. Another thing to consider when purchasing a foosball table is the warranty that it comes with. A standard warranty will be for a year. 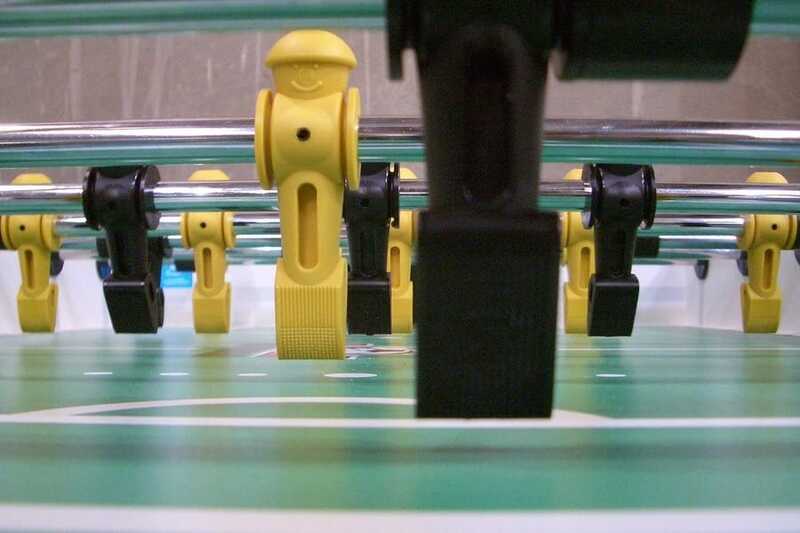 Now that you understand what you are looking for in a foosball table, here are 5 foosball table reviews to help you get started on your search. The Tornado Sport offers a solid table that is not really flashy. The cabinet is made of a one inch thick MDF, which provides durability and sturdiness. While most foosball tables use MDF, the Tornado Sport comes in a price range where a higher grade MDF is used. The selling point of this table is its strength. You can rest assured that it is going to last for a long time. The table is sold with a one year warranty, which is longer than most tables on the market. This is a heavy duty table that weighs 200 pounds, which provides a large amount of stability. Even if play gets aggressive, this foosball table is not going to move. The legs of the table are covered with boots and you can also place shims inside of the legs in order to make the table more level. This will provide both sides with an even playing surface. The steel rods of the table are hollow, which makes gameplay much faster. Experienced players will enjoy this feature while beginners may have a bit of a learning curve ahead of them. A couple of issues that some people have with this table is that it does not have counterbalanced players and the ball returns are only on each end, which makes retrieval a bit more difficult. Overall, most foosball players are simply looking for a foosball table that offers an even playing surface and is not going to move. This foosball table from Tornado delivers on both of these things. This foosball table is really ideal for children. It is an inexpensive table that has cheaper parts that are not as durable. The men have ABS construction, which provides a bit more strength, but they are made from plastic, which is more susceptible to breaking than ones made from metal. The cabinet is only a quarter inch thick and is lightweight, which means that it moves a bit during play. Overall, this is a quality budget table for children or the casual player. This is not a full sized table and it does not have the features that experienced players are looking for. This is a simple table that has the essential parts need to play foosball and not much else. The speed of the play is slow, which is good because it is geared towards play by younger children. Since it does not weigh much, the table will move during play, which may change the direction of the ball to provide one side with an advantage over the other. Overall, this is a good choice for those who are just starting out playing and want a cheaper table to learn on. The cabinet of the Carrom Signature is made from a one inch thick manufactured wood that is warp resistant. This is a heavy table coming in at around 177 pounds. This is just one indication that it is a quality table made of quality materials. The rods are made of a hollow steel and made to last. The playing surface is thick and has graphics on it in order to protect the surface from wear and tear. While there may be tables that are more durable out there, you are going to have to spend a lot more money to find one. What really sets this table apart from others in its price range is the fact that it has counterbalanced players. Intermediate and advanced players enjoy this feature because it keeps the men horizontal, which allows for more space to create shots. The weight of the table in combination with the thicker cabinet will provide the stability necessary to keep the table still even when play becomes aggressive. In addition, the handles are made from natural wood and have been designed with comfort, style, and control in mind. Overall, this is a great foosball table for the price. It has great aesthetics, counterbalance players, a solid weight, and hollow chrome rods, which all make it a good mid-range choice that is sufficient for players of all ages and abilities. 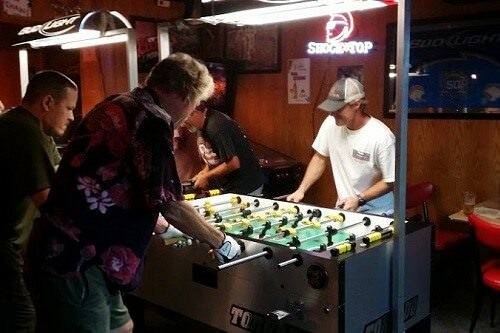 For most people looking for a foosball table the idea is to find one that will allow them to play the game and have some fun with their friends and family. For this reason, we are including one more option for the beginner foosball player who does not want to spend a lot on a foosball table purchase. The American Legend Charger Foosball table weighs in at 100 pounds and has the measurements of a standard foosball table. The playing field is made of MDF which is resistant to warping. Additional features of this table include the ⅝ inch apron and the half inch hollow rods with a chrome finish. The legs of the table are fairly sturdy as the table has a chrome finished cross bar. However, there are no levelers on the table. Since it does not have levelers, the table is not very sturdy, but it still provides an engaging and entertaining game of foosball. The hollow rod is very light, which provides faster game play. The charger is a durable table that is made from quality products and it comes in at a price that is affordable for most people. While it only weighs 100 pounds, it is fairly sturdy and if it is treated right should last for a good long while. This is a good choice of table for older kids and adults who are new to the game. Overall, this is a good choice for beginners and even some intermediate players. For our readers who are searching for the best foosball table and perhaps want something a little more affordable, the FX40 from Sport Squad might just be the best option on the market. While this foosball table may not look impressive at first glance, you will change your mind after you get your hands on it. We know that smaller tables have a reputation for being flimsy and unenjoyable to play, but the FX40 has taken that notion and flipped it on its head. 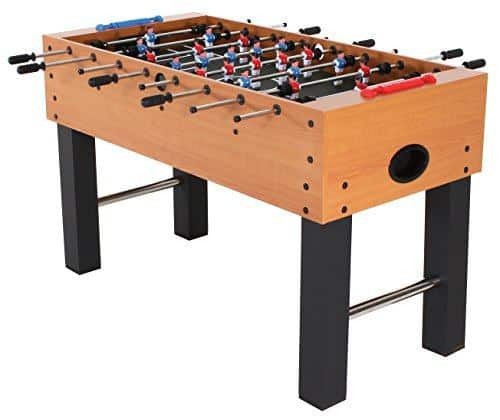 You will find that this foosball table performs closer to a full-size model than any other small table we have seen, provided you lubricate the rods, that is. Speaking of the rods, they are made out of steel plated in chrome to ensure that they won’t have any issues with smoothness or durability. From our torture tests, we learned that the rods can take quite a bit of punishment before they end up giving in, making this an ideal table for younger children. The rods also feature handles that are made out of rubber and feature an ergonomic design, making them much more comfortable for extended play sessions. Another feature that is made to improve user-friendliness is the ball return system which is simple enough not to be susceptible to damage (as are many other ball returns). Of course, our favorite part of this foosball table is just how small it is. While the vast majority of foosball tables would consider a smaller table inferior, you will find that this model has many benefits. For example, you don’t need too much storage space to put away this table when you are done playing. Other than making it easier to store, the small size of the FX40 makes it easily portable, so you can bring it with you to parties and get-togethers so you can enjoy some foosball with friends! As you can imagine, the small size also makes this table much easier to use for children, who can also have hours of fun using it. While this model may feature short and stubby legs, you may be surprised to find that they still include foam pads on the underside to keep your floors and tables from getting scratched. There are also two manual scorekeepers that are located above each player's goal, eliminating the need for a pen and paper. Overall, the FX40 from Sport Squad is designed to be a smaller table that is on the affordable side without sacrificing build quality and fun gameplay. Having accomplished this is an impressive feat, especially when you consider how many other manufacturers have tried to make foosball tables such as this one and failed. When it comes to high-quality tables, few can match the Royalton 55-inch table from KICK. 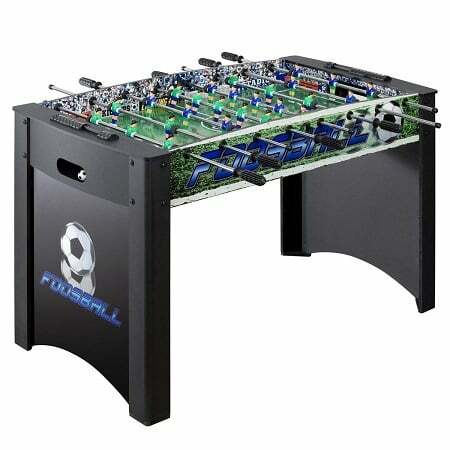 This foosball table comes included with all of the features that you can expect to find on premier brand models, but it is much more affordable. In fact, this table is half the price of some of its competitors. With a lower price point, anyone would expect a dip in quality, but that is not the case with this foosball table. While this model may not come included with all of the modern bells and whistles you can expect to find on the top offerings, it makes for an excellent game of foosball, and it is reliable. These two aspects are more than you can ask for out of many other foosball tables, so the Royalton has us understandably impressed. Let’s get right into the features that stuck with us the most. 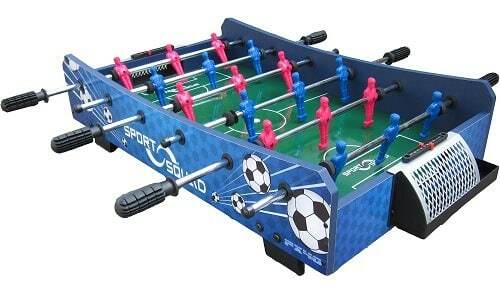 The first thing that you will notice is that this foosball table comes included with multiple sets of players. There are 13 red foosmen and 13 blue foosmen that come included with this table, all of whom are counterbalanced, in addition to a set of 26 uniformed players. As you can see, you won’t be running out of players anytime soon, and you don’t have to play with counterbalanced ones if you prefer not to. Something else that may impress you about this table is that it comes with a lifetime warranty, meaning that you will have it for quite some time to come if you treat it well. Coupled with this foosball table’s excellent build quality, if you need a reliable option, the Royalton may be your best bet. There are also many quality of life features included in this table to make it more enjoyable to play. For example, the wooden handles feature a no-slip design so you won't have to worry about losing shot accuracy as the game goes on and your palms start to get a little more sweaty. You can also choose whether you prefer a one-goalie system or a three-goalie system, as that will depend on the set of rules that you play with. Most of the time, the three-goalie system is the better choice as it will decrease the frequency of stuck balls. Although many people may be initially put off by the idea of purchasing a large item like a foosball table online, there are many benefits to this method, and in reality the advantages far outweigh any possible drawbacks. When buying online, large sites like Amazon will contain multiple reviews of each make and variety, often with follow ups, feedback and answers to common queries and questions. Amazon also often provides an opportunity to question the manufacturer or purchaser directly. The product specifications and dimensions are available to view, so rather than bring a measuring tape down to the store, you can plan your foosball location and storage all in advance. 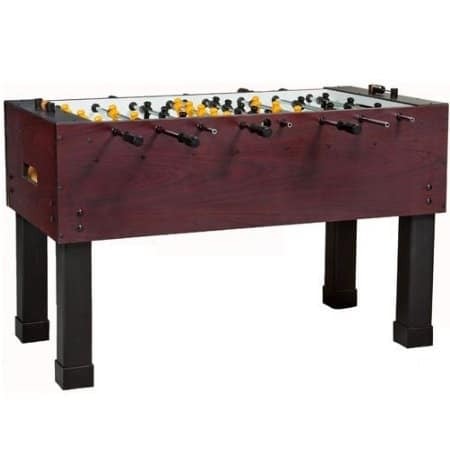 Buying your foosball table online will also mean delivery to your door, which is a huge advantage, for what can be large, bulky awkward items to transport. On top of this, the chances are that you’ll be pleasantly surprised by the cost of delivery, as sites like Amazon deliver many items over a certain price Free Of Charge! That’s right, Free Of Charge! Items that fall under their Prime program, will also qualify for this delivery service. It’s really a no brainer. When buying online you have a standard statutory right of return and experienced retailers like Amazon have a fantastic returns and refund service. Online retailers do not have the same overheads as high street merchants, so when making a large or out of the ordinary purchase for an item such as a foosball table, with a little research, there can be genuine, substantial savings to be made. Amazon also often offer Warehouse Deals on items with damaged packaging or minor cosmetic imperfections, which can furnish impressive savings and still come with an Amazon warranty and guarantee. They say "variety is the spice of life", so whether you’re after a multi game, table top or stand-alone unit, you’re more likely to find your perfect model when you shop online. Benefits - Why you need one Today! The benefits and advantages are too many to mention, but here are a few obvious ones. Foosball is all weather, so while rain might stop play on the football pitch, this is an ideal way for friends and family to while away an inclement day and not get soaked to the skin out in the elements. Following on from above, foosball is a great way to spend great quality time, in a fun environment, with both friends and family. It doesn’t discriminate between old and young, it’s an all inclusive activity that generations can understand and enjoy together, and for parents it’s an indoor activity that for once doesn’t involve a screen and will get the kids away from their consoles for a change. For a night in, entertaining, your foosball table will be the center of attention and you may find your friends are calling to see you to hang out more and more often. What better way to catch up, than an informal evening with friends, a few beers and a little foosball. With the money you save by staying in, your table will probably not only pay for itself in no time, but maybe even bring you out ahead! When you welcome new guests into your home, those awkward, eternal, uncomfortable silences may be a thing of the past. Your foosball table will be a natural icebreaker as it’s a game everyone loves to play. (If they don’t love it they should be asked to vacate the premises anyway)! There’s no need for conversation, you can do your talking on the table. You don’t need a mansion or a massive extension to house one of these units. With so many options available from tabletop to multi-game to stand-alone, foosball is something that every household can accommodate and enjoy. Don’t let anyone tell you that foosball isn’t a sport. Ask anyone who has played at any level and they’ll let you know that you’ll have no problem in breaking a sweat. Foosball requires dexterity, nerve, great hand to eye coordination, concentration and stamina to play well. Playing and practicing foosball regularly will improve all of these aspects, the benefits of which can only improve your life and well-being. Finally, on top of all the fine factors mentioned here, foosball is fun, and in a more stressful, fast paced and competitive society and world, a little bit of fun doesn’t sound so bad. If football has been described as "the beautiful game", then foosball is 'a little beauty’, and everyone could do with a bit of that in their life and home! Conclusion - Best Foosball Table. Foosball is a really fun game that just about anyone can enjoy. Having a foosball table for your home can be a great source of entertainment for families and friends. Although there is much debate about the origin of foosball, or table football in the vernacular, there is a suggestion that it may have been around as early as the late 19th century, and so like its larger counterpart, this miniature version of the beautiful game has withstood the test of time and captured the imagination of generations. While there are many different styles of foosball tables on offered, investing in a quality table in your price range that will, like the game itself, last the duration, will definitely prove better value in the long run and provide years and maybe even decades of pleasure. Like in any other walk of life, when it comes to the purchase of a foosball table, the same rules apply. That is, "if you pay peanuts, you may get monkeys", or "if you buy cheap, you will get cheap". 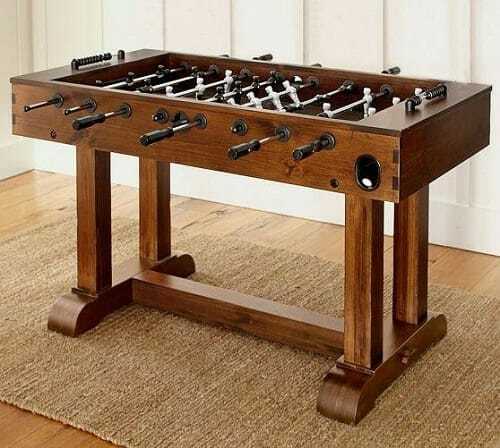 Buying a cheap or flimsy foosball table may be a sensible option for a children’s Christmas gift that may only be used for a couple of days and then be destined for the garage or the attic, in other words, it doesn’t need to last. If you’ve got the foosball bug however, then quality is your best investment to stand the test of time.